Mommy's Bliss Probiotic Powder Packs help provide support for a healthy digestive and immune system. Our formula uses Lactobacillus Rhamnosus GG; the most studied probiotic strain with over 800 scientific studies worldwide. Our family-run company was founded by my mom, raised three children while working as a registered nurse, lactation consultant and certified nurse midwife. Driven by compassion, she created Mommy’s Bliss to safely and naturally bring families back to wellness. 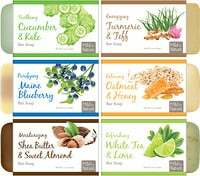 **Each packet contains 5 billion live probiotic cells at time of manufacture. 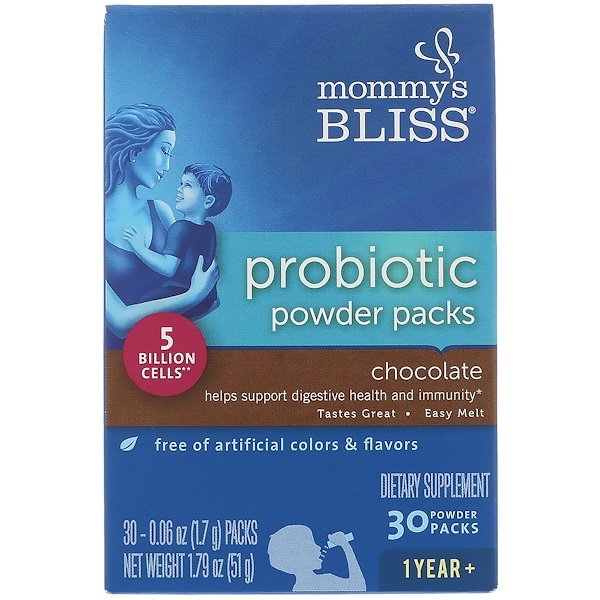 Mommy's Bliss Probiotic Powder Packs are easy to use. Just mix contents into a favorite food or beverage. 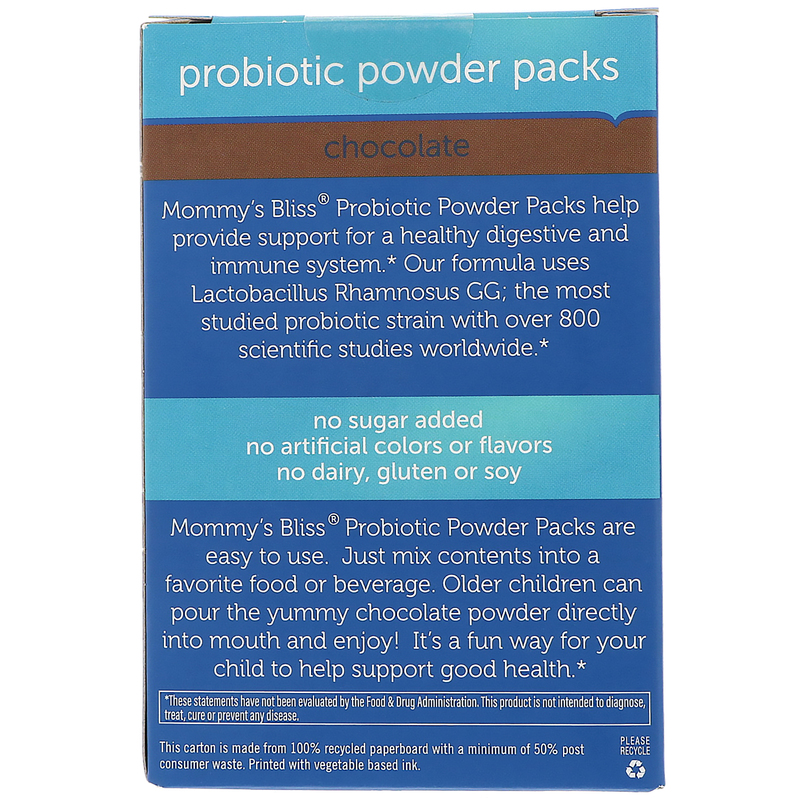 Older children can pour the yummy chocolate powder directly into mouth and enjoy! It's a fun way for your child to help support good health. 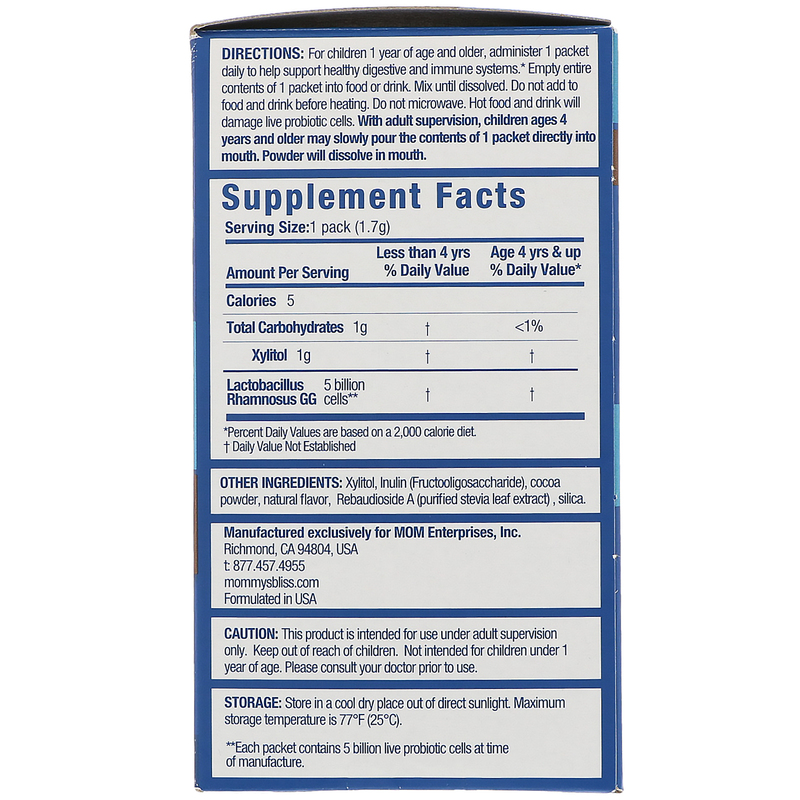 Xylitol, Inulin (fructooligosaccharide), cocoa powder, natural flavor, rebaudioside A (purified stevia leaf extract), silica. This product is intended for use under adult supervision only. Keep out of reach of children. Not intended for children under 1 year of age. Please consult your doctor prior to use. Storage: Store in a cool, dry place out of direct sunlight. Maximum storage temperature is 77ºF (25ºC).